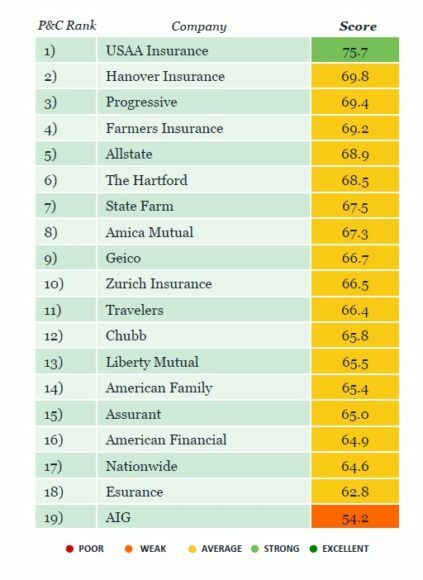 USAA Insurance has the highest and best overall reputation among insurers, according to a new report from the Reputation Institute. The insurer landed in the top spot based on criteria including strong reputation, relevancy, expressiveness (brand strength, informativeness, relevancy), products and services, governance, citizenship and innovation. MetLife, New York Life and Blue Cross Blue Shield grabbed the second, third and fourth spots, respectively, on the 2018 U.S. Insurance RepTrak ranking that covers property/casualty, life and health insurers along with investment firms. In issuing the report, the Reputation Institute said that insurers have reputational challenges that other industries don’t. The insurance industry has an average 71.3 reputation score as of September, up from 65.9 in February 2018, according to the survey. As the top insurance company, USAA scored a 75.7 ranking. The next highest P/C carrier – Hanover Insurance – scored a 69.8, followed by Progressive, at 69.4, Farmers at 69.2 and Allstate at 68.9.